The Allied Rapid Reaction Corps (ARRC) was recently exercised and certified in a ‘Joint Force Trainer (JFT)’ headquarters role. It was planning and conducting a Crisis Response ‘Small Joint Operation’ that was land-centred (SJO L) and involving high intensity warfighting. All this happened during the Trident Jaguar 2015 (TRJR 15) exercise run by Allied Command Transformation’s (ACT) Joint Warfare Centre in Stavanger, Norway, and with this certification the ARRC is one of NATO’s available operational headquarters’ response forces. TRJR 15 is part of an extensive series of exercises taking place across Europe, aimed at demonstrating defence capability, assuring Allies and deterring aggression against the Alliance. Moreover, TRJR 15 is set to be a demonstration of NATO’s commitment to the collective defence and security of member states. “Exercise Trident Jaguar 2015 marked the way ahead after the 2014 NATO Summit, being a vivid presentation of training evolution,” General Zuliani said. “In fact, TRJR 15 demonstrated NATO’s military interoperability with civilian organisations. NATO has shown that it is able to integrate forces from across the Alliance and capable of deploying, planning and effectively responding to crisis on its boundaries,” the general said. Exercise TRJR 15 was a two-level (Operational/Tactical) ACT-sponsored Command Post/ Computer Assisted Exercise (CPX). 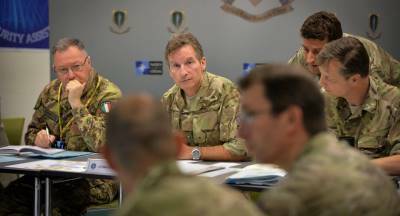 It independently exercised and evaluated the United Kingdom-led ARRC and Italy’s NATO Rapid Deployable Corps (NRDC). A large-scale scenario set over land, sea and air pushed the staffs’ core land abilities to coordinate resources, synchronise assets, disseminate information, develop courses of action and provide recommendations to the Commander.